This quick pasta recipe uses chicken as the main protein source, although traditionally, lasagne is made using a meat sauce (ragu). Lasagne refer to wide, flat, sheets of pasta but also to a dish, which is made by interleaving layers of pasta with meat sauce. 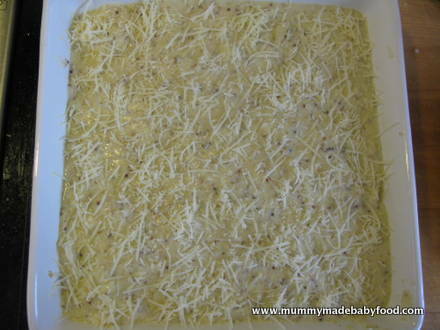 Once assembled, the lasagne is then baked in the oven before serving. Possibly one of the oldest types of pasta, lasagne originated in the Emilia-Romagna region of Italy. It has been adapted in other regions outside of Italy to include ricotta, mozzarella and a number of different meats and vegetables. This quick pasta version simplifies what can sometimes be a labour-intensive process of preparing lasagne. 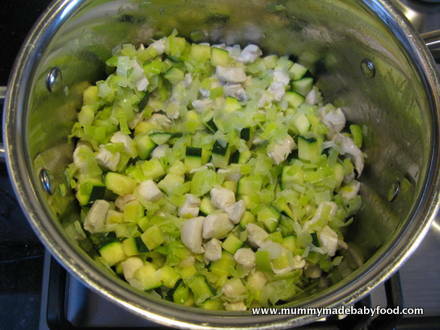 Using chicken in the quick pasta recipe below should make the flavour more palatable to smaller children and babies. 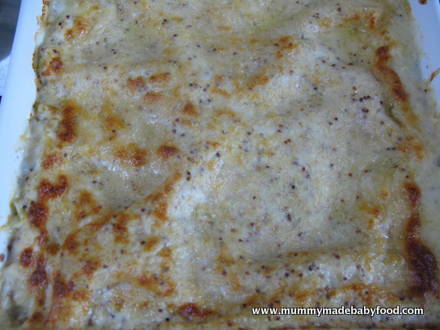 You may wish to omit the Dijon mustard initially, until baby is a bit older, or if yours is an adventurous eater, then include it straight away! This recipe yields approximately 8 servings of lasagne. Pre-heat the oven to 180C / 160C Fan. 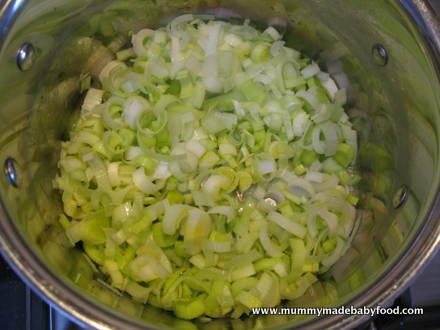 Heat the oil in a large saucepan, add the leeks, and cook for a few minutes until they begin to soften. 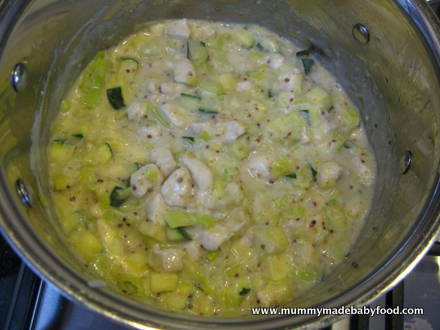 Add the courgettes and chicken, and stir-fry for a few minutes until the chicken is just cooked through. Set aside. 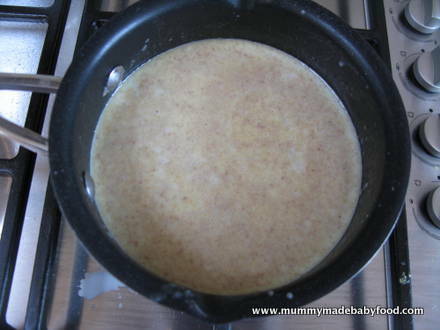 Add the flour and cook, stirring continuously, for 1 minute. 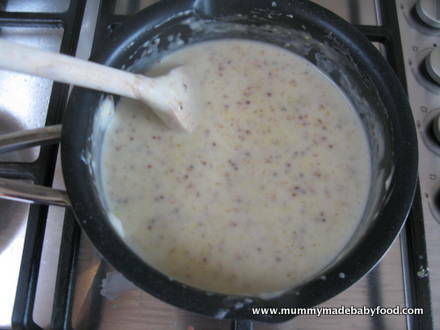 Remove the pan from heat, and stir in the milk, a little at a time, until the sauce is smooth. 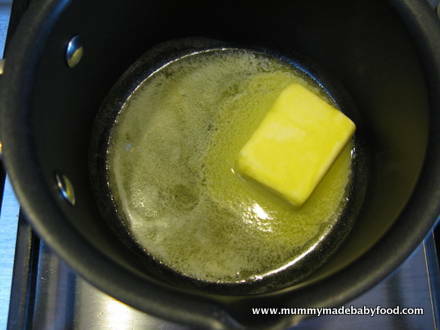 Return the pan to heat, and bring gradually to the boil, stirring continuously. 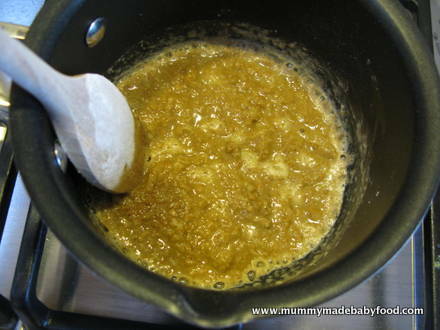 Then simmer for 2 minutes. Add the mustard (if using), and remove from the heat. 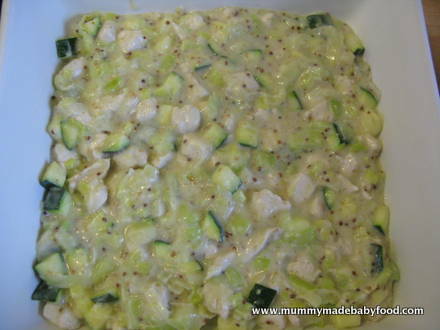 Mix 2/3 of the sauce with the chicken and vegetables, and reserve the remainder for topping the lasagne. Soften the lasagne sheets slightly by soaking them in a bowl of just-boiled water. Lightly grease a 23cm (9 inch) ovenproof square pan. 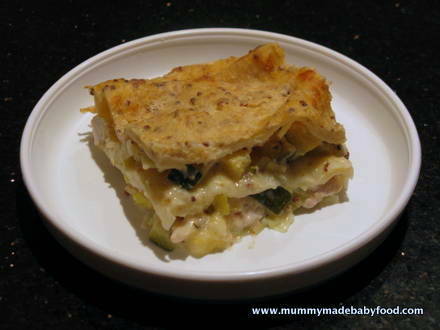 Layer the chicken mixture and lasagne sheets, starting with a layer of chicken, and finishing with lasagne sheets. Spoon the reserved sauce over the lasagne, sprinkle with the Parmesan. Bake in the pre-heated oven for 25-30 minutes, or until golden brown on top. Allow sufficient time to cool before cutting into pieces and serving.